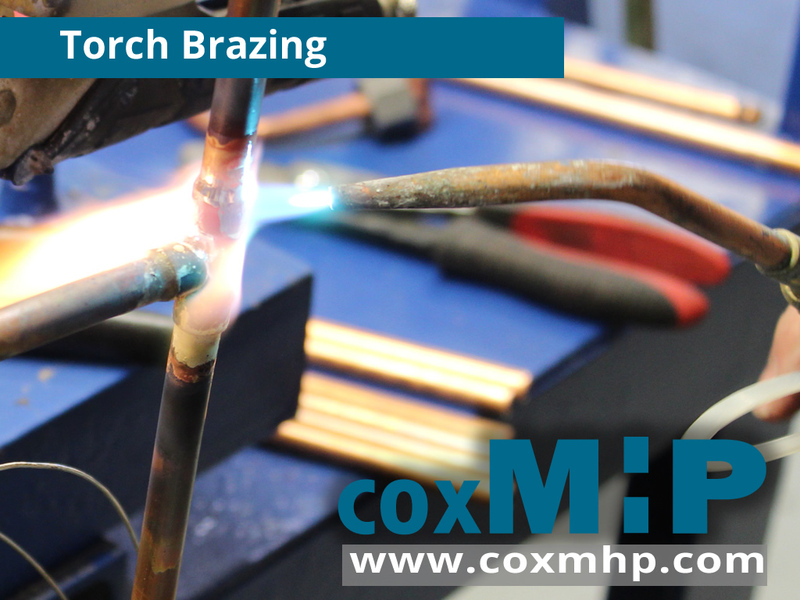 Torch brazing is the most common form of brazing, and so CoxMHP utilizes this process often for a variety of applications. It’s typically used for small production or in specialized processes. Three processes used in torch brazing are manual, machine and automatic torch brazing. Manual torch brazing is a procedure where heat is applied using a gas flame where the joint is being brazed. It can be handheld or placed in a fixed position depending on if the operation is manual or has a certain type of automation. Manual brazing is used in small production or where other types of brazing become impossible due to the size of the part. There is an art to manual brazing, as it requires great operational skill to get quality joints brazed. CoxMHP has the experience to braze any application. Flux material processing helps with oxidation. If you’re copper brazing with an oxygen and hydrogen torch you don’t have to flux. Machine torch brazing is used where you have a high repetitive production taking place. CoxMHP can utilize these types of brazing for your long run application process. This is a manual and automated process, where an operator places brazes material, flux and jigging parts while the machine completes the actual braze. It reduces the high labor cost and required skill level while increasing efficiency. Flux is required for this process because their is no protective atmosphere. This process is suited for small or medium operations. Automatic Torch Brazing is a method almost eliminating the need for manual labor in the operation, except for loading and unloading the machine. The equipment is essentially the same used for machine torch brazing except for the operator being replaced for part of the preparation process. CoxMHP has the expertise to complete your torch brazing job on time and within budget every time.